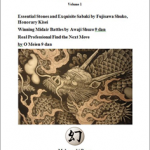 I contacted the Nihon Ki-in to get an explanation of the writing on the cover of Kido, MaRyoy 1972 from which the following article is taken. However, they failed to answer me. 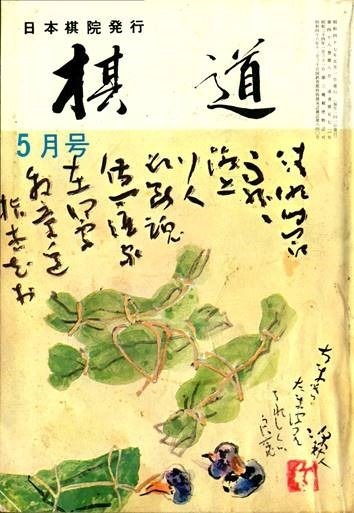 I imagine that is because the poem is by Ryokan, whose work was featured earlier and at that time the Ki-in said that no one could read the poem. Ryokan was a curious character who had unorthodox ideas about poetry. His work is very hard to understand. So the reader must make of this poem whatever comes to mind. I happen to like the lightning go game that follows. In fact, I have posted it to the GoWizardry website before, but that game record came from the Kido 1973 Yearbook, which only gave a slight analysis, just a few sentences. I recently was given several old Kido magazines, and found the complete analysis in one of them, so I am offering the translation here. Played on March 12, 1972 at the television studio of Tokyo Channel 12. 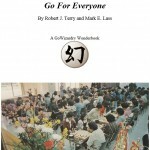 White 8 played as the Taisha fencing-in move at A would continue the imitation go [mane-go], but the relationship of ladders that might arise is complex, so it was probably deemed safe to avoid this in a lightning go game played on television. 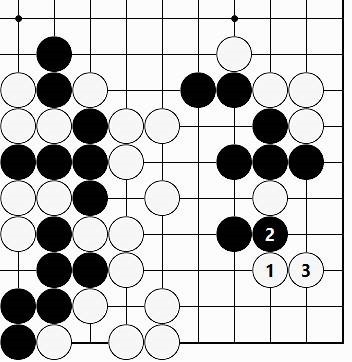 For White 12, the joseki proceeding from the connection at 13; for White 14, the variation starting with the cut at 17; things like this may be considered, but in the end the sequence through Black 23, the model Taisha joseki that has been passed down through the ages, was the one chosen. 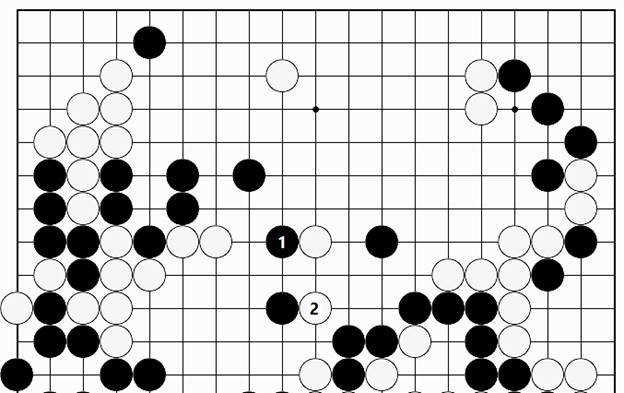 …White would make the one point jump to 1, but the Black checking extension from the lower right corner feels precisely played. Therefore, I tried the off-beat knight’s move of White 24 to see what would happen. But after all, how should this be evaluated? The fencing-in move of Black 25 really feels like the only move to play here. 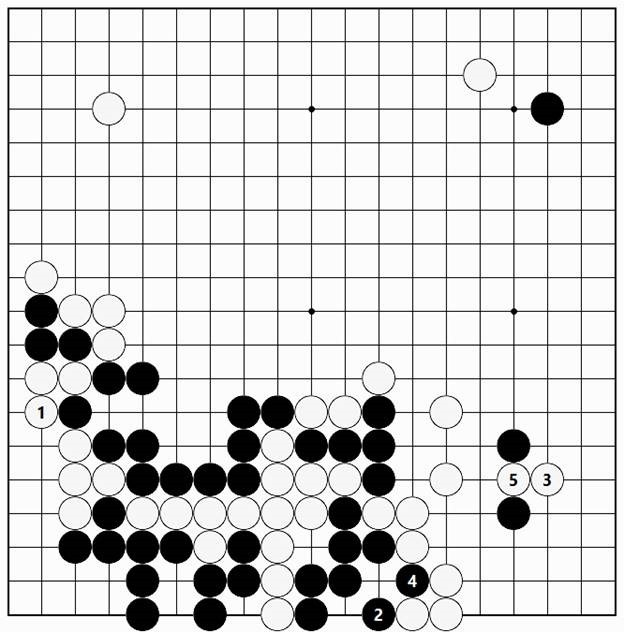 The sequence through White 28 is a natural progression of moves, but then Black 29 is a severe conception typical of Utaro 9 dan. With this move, the fencing-in move of Black 30 would usually be played. However, the fact is that this would lead to White A, Black B and White 46, simply and easily settling the group, and this was probably unsatisfactory for Black. Pushing in with Black 35 and cutting with 37 is another resolute playing method, but judging from the result, this is somewhat unreasonable. 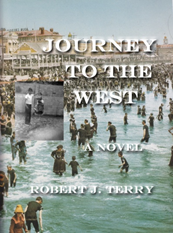 The progression of moves from Black 1 through 7 may be viewed as sufficient. …the attachment of White 1 is tesuji. 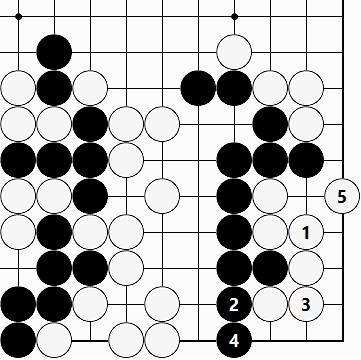 In response, if Black plays A, White replies at B, and if Black B, White A, the two alternatives being equivalent options whereby Black’s two marked stones can be captured. 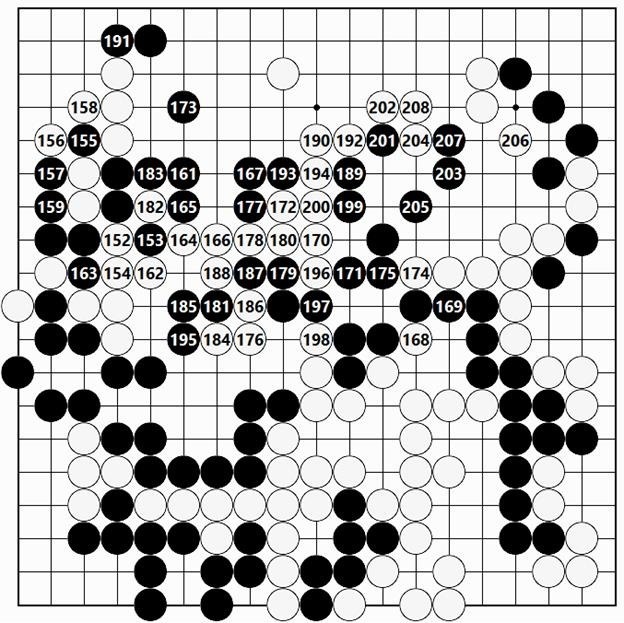 By slicing through the knight’s move with White 52 in the previous figure, White was able to sever Black’s connection. At a steady pace the opponents are plunging into an unavoidable race to capture. Black 61, simply filling liberties, is a terrible missed opportunity. 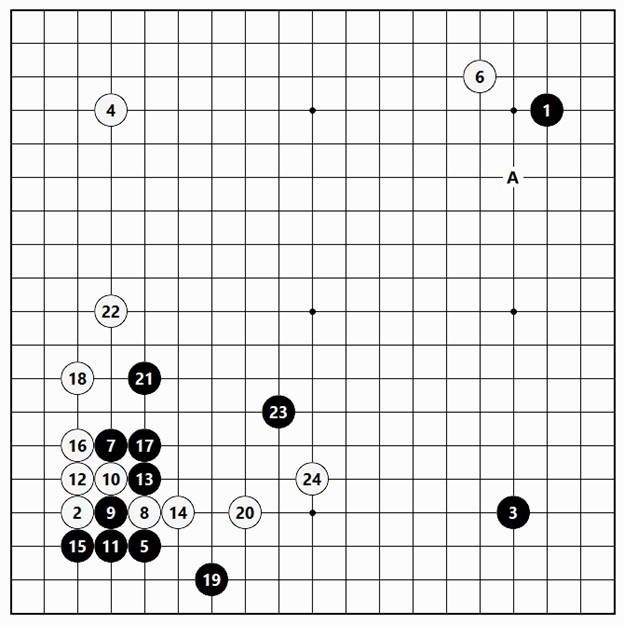 With this move, peeping once at Black A as a forcing move (answered by the connection of White B) would be good timing. As a result, the condition of the lower right corner would be completely different. 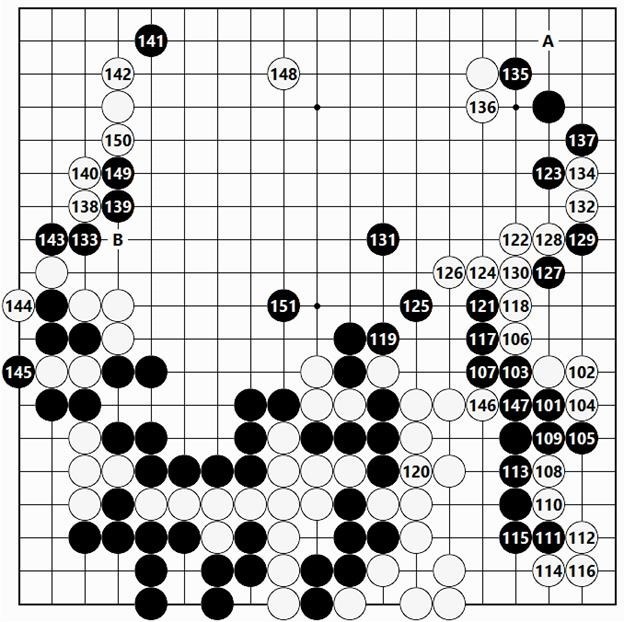 The play through the connection of White 68 is an unavoidable order of moves, leading to a two-step ko. For both sides this is a difficult position to resolve. 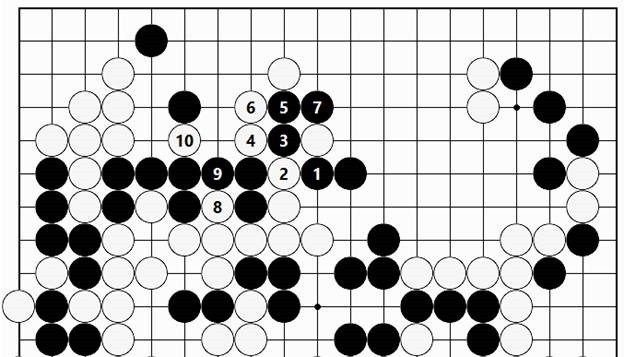 Black 71 and 73 are played to create ko threats. In response to the ko threat of Black 79, White 80 is a failure. Here, the diagonal move of White C is correct. 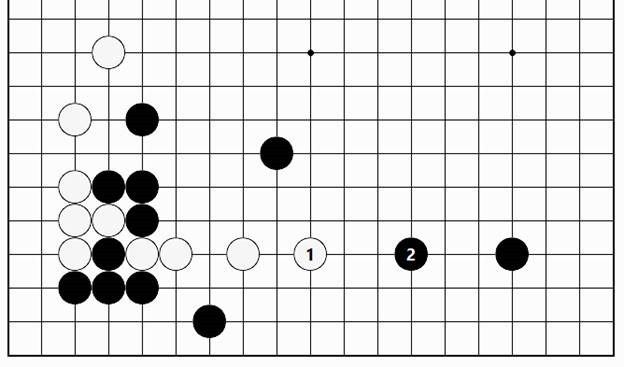 After that, it would be White’s pride and joy that no move of Black’s in this area would need be answered. …replying with the move of White 1 would also be strong. When Black retakes the ko with 2, White has the ko threat of 3 available. With Black 4 and White 5 a large scale swap takes place. Evaluating this result shows that although White has discarded 14 stones, when it comes to balancing accounts, White has some extra change coming. Regardless of that, the swap after White 94 and Black 95 is clearly satisfactory for White. Following this division, White has sente to attack the lower right corner with 96. The game is easy for White to play. The turning move of White 4 is an essential move. Simply playing the hane of 6 would incur the block of Black 4, so that Black ends up settling the position in a simple and easy way. …playing White 1 at the 3-3 point is correct. Should Black reply at 2, White descends at 3, and the territory in the corner is different. …connecting on this side with White 1, and living in the corner through White 5 would have been more profitable. 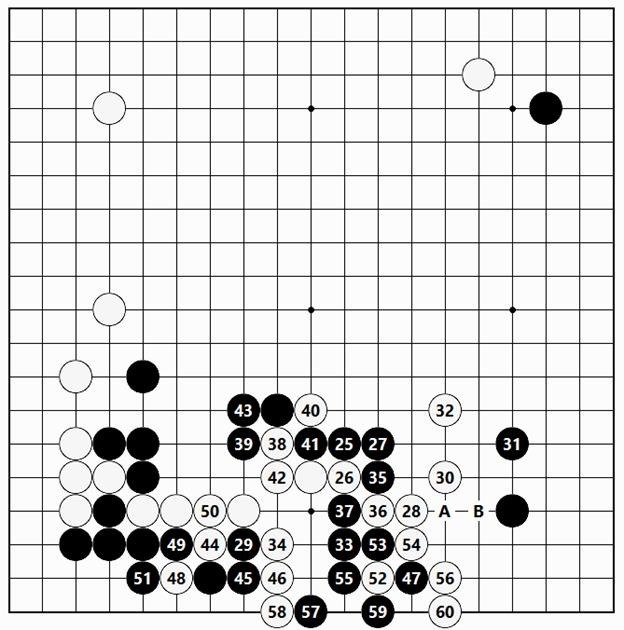 With the course of play in this figure, the capture of two White stones is left, so this is clearly a loss. 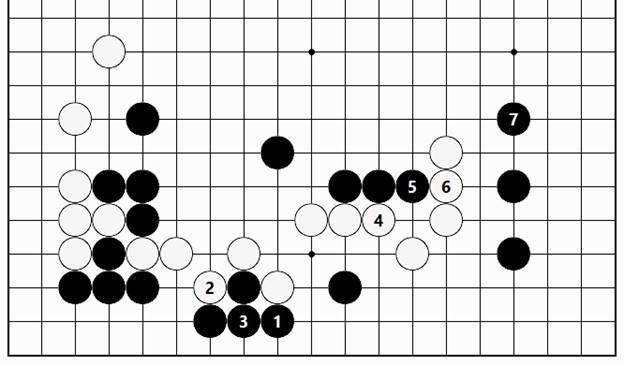 …one might feel inclined to tenaciously play Black 1, but when, in the opposite way, White gets to occupy this essential point of 4 first, White’s territorial framework on the upper side would seem to become threatening to Black. Black 33 is a line [suji] aimed at for some time. Pushing with White 34 is questionable. Immediately making the diagonal attachment of Black 35, followed by 37, Black is allowed to effortlessly make life, which is no good. Instead of 34, White should have slid to A, robbing Black of a base. White 46 is a move to gain time on the clock before the sealed move, but with this move White should have cut at B as a probe. This would have been strong. If Black uses 61 to simply cut at 63, White would consolidate the territory on the upper side on a large scale, and Black would have little chance of winning the game. 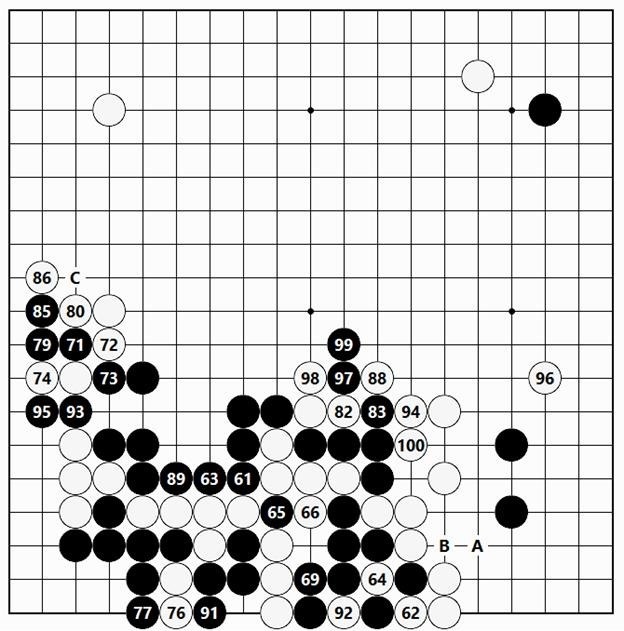 For White 62, as might be expected, connecting at 63 and thereby capturing the four Black stones here would have been sufficient. Getting one’s own stones squeezed by Black was distasteful, so White counterattacks with 62, but a rough time cannot be avoided. …this is the place to consider counterattacking with Black 1. White attaches at 2 and how in the world this will turn out is a little difficult to guess, but regardless of that, this move was Black’s last chance. …even if Black daringly pushes through with 1 and cuts at 3, after White 10, Black is left without a move. In the end, Black’s large group of stones extending from the lower right corner into the center cannot get two eyes, and winds up dying a fighting death. 208 moves. White wins by resignation.